I just heard a talk by social network creator extraordinaire Clio Andris about redefining regional boundaries in the UK based on telecommunications data. Her group took data from 12 billion telephone calls made over the space of a month and created a social network based on this (Ratti et al. , 2010). This network was then used to calculate how closely connected two neighbouring locations were. By optimising the spectral modularity, the best-fitting boundaries could be defined. A comparison of the two experiments. 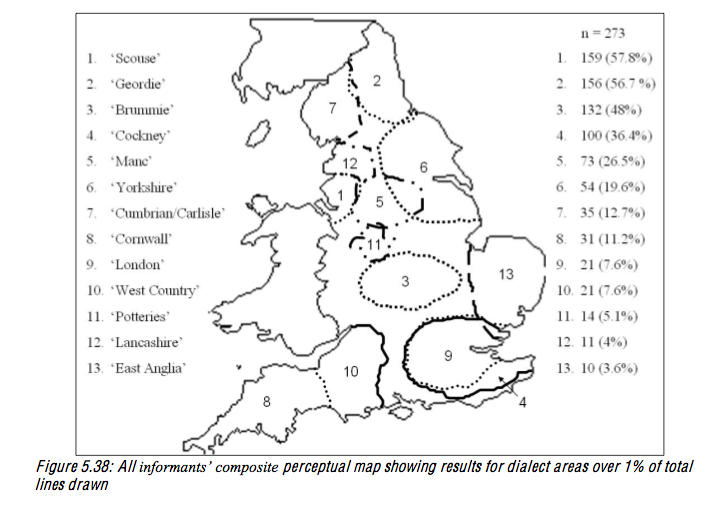 One of the first things that struck me was the similarity with a map of regional accents (apologies for the quality of the accent map – I couldn’t find the one I was looking for). Apparently, people are talking to people that sound like them. Or, people who talk to each other sound like each other. This isn’t covered in the paper, but seems like an important issue. 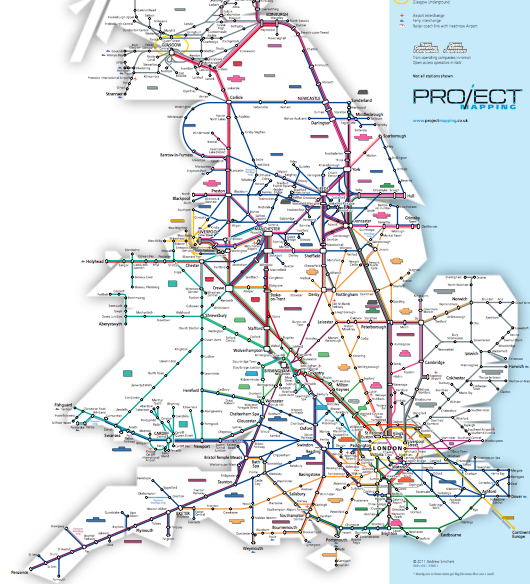 Secondly, the rail links also seem to form the ‘backbones’ of the communications regions. This is also mentioned in the paper. However, these two features are linked. Coming from Wales, the important fit here is the three-way split in Wales. South Wales feels like a different country to North Wales – culturally and linguistically. However, both are linked by having large amounts of natural resources: Coal in South Wales and slate in North Wales. This lead to massive migration into cities in the north and south, and rail links were set up to extract these resources to London or the nearest ports: Cardiff in the south and Liverpool in the north. Thus, it’s still a real pain to get from North Wales to South Wales. The picture is somewhat true of the east and west sides of the north of England. So, the natural resources concentrated people and transport links. However, it also concentrated political views. The large migrant community in Wales, working for little pay in large mine institutions, became unionised. Socialism emerged, promoting political movements that lead to the minimum wage. The point being, natural resources, transport links and politics are connected with some being historically dependent on each other. 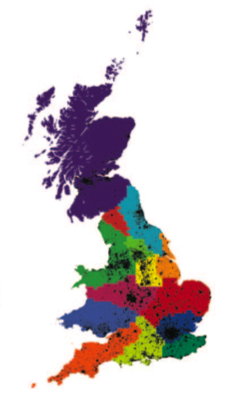 This is, perhaps, precisely why splitting the nation by who speaks to who is a good measure of political regions. 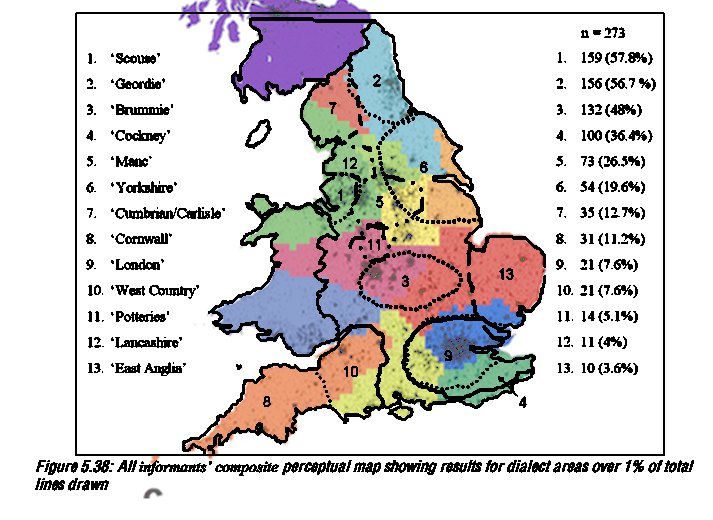 It would be fascinating to see how linguistic divisions interact with these variables. Good Grief, Charley Brown! 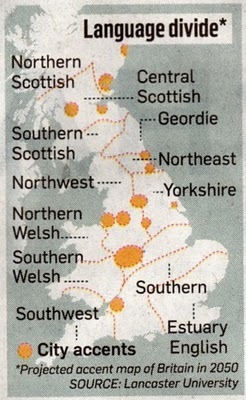 How does Central Wales link up to East Anglia! ?